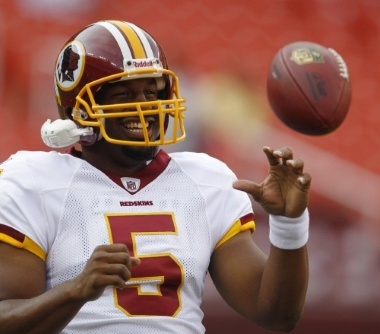 Redskins quarterback Donovan McNabb worked out with his former Philadelphia Eagles teammates on Wednesday, Dave Zangaro of CSN Philadelphia reports. According to the report, McNabb and a handful of his former teammates, including Trevor Laws, Jamaal Jackson, and Juqua Parker, did agility drills and weight training at Memorial Sports Complex in Marlton, New Jersey. In a normal offseason, division rivals working out with one another may raise an eyebrow or two, but the odds of McNabb remaining in the NFC East next season are slim. With players spread out all over the country, cross-pollination during lockout workous has been commonplace. Tennessee Titans linebacker Tim Shaw has been a frequent participant in Detroit Lions workouts, while Seattle Seahawks wide receiver Golden Tate has been working out with Titans players in his native Nashville.